The Balconies performs during Filter's Culture Collide at The Echo in October. 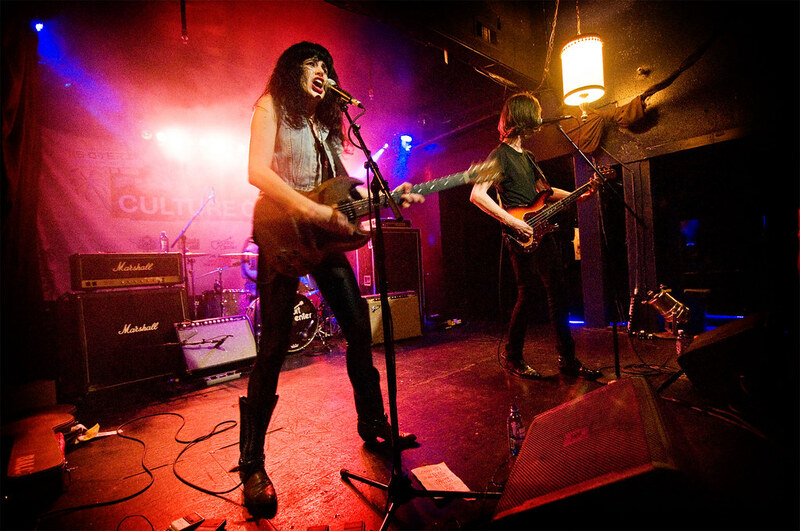 Our favorite band coming out at this years' Filter Magazine's Culture Collide Music Festival was The Balconies, a trio from Canada who recently debuted their new video for "Do It in the Dark." It shows lead singer Jacquie Nevelle and her unsuspecting friends camping in the woods, leading to a surprise gory ending with Gap-like zombies. "Jacquie Neville leads vocal and guitar like an insane immortal sorcerer setting herself on fire for fun, repeatedly. She spasms as though possessed by a James Brown in flames. She does this while transforming her guitar into a rampaging adrenaline drugged bull. Her voice sounds like a disco Blondie, but instruments lash with guitar and bass torturing tones of Psychobilly. Neville's performance vibes of a damsel turning werewolf in dead of night under a full moon disco ball. She has to be seen for this to be truly understood and believed. Supernatural." Tegan & Sara Release Official Video for "Closer"